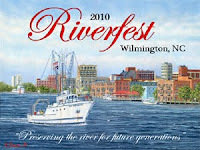 The Wilmington Riverfest is a cultural street festival celebrating the beautiful Cape Fear River. This free family- oriented festival began in 1979 and is still going strong. On Saturday and Sunday the street fair winds its way along the Cape Fear River with continuous live entertainment on two stages, arts and crafts and food concessions. In addition, the Back Door Kitchen Tour will take place. For ticket information see the Residents of Old Wilmington website. Downtown on Market Street will be the Sun Coast Cruisers Classic Car show and the Cape Fear Chapter Antique Automobile Club of America Car show. As the sun sets the Invasion of the Pirates boat flotilla takes place on Saturday followed by fire works at 9:05 p.m.
A Riverfest Endowment Fund benefits the Cape Fear River environment through the Cape Fear Community College Marine Sciences Division in the form of scholarships. We look forward to hosting your stay at our wilmington nc bed and breakfast, just a short stroll to the riverfront, as we all celebrate the Cape Fear River! This entry was posted in Cape Fear River, riverfest lodging, wilmington nc bed and breakfast, Wilmington Riverfest by Doug Erickson. Bookmark the permalink.